Molecular Biology and Medicine 2018 provides better leading speakers, researchers, academic scientists and research scholars to exchange and share their experiences and ideas about Molecular Biology and Biochemistry. It can also provide a better platform for practitioners, researchers and educators to present and discuss the most recent innovations, trends, as well as practical challenges encountered and solutions adopted in the fields of Molecular Medicine, Nuclear Medicine, Gene Therapy, and Cell Signalling. This method are used to study the molecular and biology including structural and functional of biomedicine, molecular enzymology, and molecular immunology, theoretical bases of biotechnology, physical chemistry of proteins and nucleic acids and analysis of DNA and RNA. The organizing committee is gear up for an informative conference program including plenary lectures, symposia, workshops on a variety of topics, poster presentations and various programs for participants from all over the world. Main topics of this conference are Molecular Biology, Molecular Enzymology, Molecular Toxicology, Molecular Pathology, Molecular Pharmacology, Molecular Microbiology, Molecular Drug Designing, Molecular Cloning, Molecular Diagnosis, Pathology and Molecular Medicine, Microbiology and Molecular Genetics, Evolutionary Genetics, Genetic Engineering, Cell and Gene Therapy, Cell Biology, Structural Biology, Structural Bioinformatics and Proteomics, Biochemistry, Metabolomics, Nuclear Medicine, and Medical Diagnosis. We are oorganizing International Conference on Drug Formulation Series in consecutive years at Europe, over the last several years which met with great achievement in Business Conferencing and it has marked its Business very excited to expand America and Asia Pacific continents. Previous meetings were held in major cities like Seoul, Rome & Frankfurt. It’s time to announce “10th Annual Congress on Drug Formulation & Analytical Techniques” held September 03 – 04, 2018 at Dubai, UAE. ME Conferences invites all the participants from all over the world to attend ‘10th Annual Congress on Drug Formulation & Analytical Techniques during September 03 – 04, 2018 at Dubai, UAE. The main theme of the conference is “On-going Research & Inventing a Formula for Developing Drug and Analysis” which includes the prompt keynote presentations, Oral talks, Poster presentations, Video Presentations and Exhibitions. Orchestra Miami invites you to discover one of the iconic landmarks of the MiMo architectural style-the Vagabond Hotel! Take a closer look at our city’s unmistakable MiMo style of architecture through the ears of mid-twentieth century American composers in this unique poolside chamber music event. The concert includes works by Leonard Bernstein, Aaron Copland, Alan Hovhaness, and two premieres by Marvin David Levy, performed by soloists from Orchestra Miami and Artistic Director Elaine Rinaldi. Also on the program is guest artist, soprano Jennifer Tipton, performing works by Samuel Barber. This concert is presented as a part of Orchestra Miami’s “Discover Miami Through Music” series, and is supported by a generous gift from the Christian Humann Foundation. Relax by the pool with a drink from the poolside bar and enjoy the music al fresco! Advance purchase tickets are $40 general admission and $30 for seniors 65 and better; prices slightly higher at the door, $45 / $35 for seniors. The Vagabond Hotel is located at 7301, Biscayne Boulevard, 33138. Valet parking is available for $7 per car and street parking is available on both sides of NE 6th Court, one block east of Biscayne Boulevard. Tickets and information can be found at www.OrchestraMiami.org or by calling (305) 274-2103. Free beer courtesy of Peroni with donation of Toys for the children. – Sports stuff- basket/soccer balls, Frisbees, etc. Please help make this a special holiday for them! Come celebrate Bousa Brewing Co.’s grand opening with Miami’s very own Locos Por Juana on Friday, November 10th! There will be food, games, live music, and #SimplyGoodBeer, of course. Bousa is the first artisanal brewery in Miami’s Little River District. We’re all about keeping life simple and making memories. Let’s do it together. In its 16th year, the Greater Miami Convention & Visitors Bureau (GMCVB)’s Miami Spice Restaurant Program is teaming up with Estefan Kitchen for an exclusive preview of the hot new Design District restaurant’s Miami Spice menu before the program kicks-off August 1, 2017. For one night only, on Wednesday, June 14, 2017, guests can enjoy a one-of-a-kind dining experience in a 1950’s Cuba inspired setting with Chef Odell Torres. The three-course meal will allow diners to relish in the flavors inspired by traditional Estefan family recipes and experience the new restaurant’s Miami Spice menu, available August through September. Priced at $55 per person (excluding tax, tip and additional beverage purchases) the dinner will include complimentary pours from Miami Spice sponsors Chandon, Stella Artois, Terrazas de los Andes and Fiji Water as well as the live entertainment the restaurant is known for. Memorial Day Weekend Brunch at Phuc Yea! Phuc Yea! & Savor Tonight invite you to a boozy brunch at Phuc Yea! on Sunday, May 28 starting at 12:30 p.m. Guests will enjoy a Vietnamese-inspired, Cajun-influenced brunch menu created by Chef Cesar Zapata. Upon arrival, guests will be greeted with a specialty cocktail, and then, sit down to enjoy a family-style brunch. In addition to the special menu being prepared for the group, guests will enjoy bottomless mimosas. Cost is $55, if purchased by Friday, May 25 or $60, thereafter, if space is available. This includes a welcome cocktail, bottomless mimosas, a 3-course brunch menu, tax and gratuity. If you ever heard that real estate is the greatest business in the world, you are right – it is. This is Morris Vahnish, Author of the book, “The road to real estate wealth.” I have been a full-time investor for 20 years and I am looking for a few protégés to take under my wing and into my real estate circle! Seeking serious minded, responsible, organized, and motivated individuals to get involved. Possibilities are endless and returns are strong! If you have some real estate experience, it’s a plus, but not necessary. This is an opportunity to learn, grow, and make money. Possibilities are open to join our team as mentees and partners. Join our team and existing infrastructure. Resister now for 2 free tickets​! The official closing event of SSF, the Women’s Brunch celebrates everyday women with extraordinary courage, in memory of Vanessa Baez. For the past 10 years, women have gathered together to remember the life of one woman in the spirit of celebrating all women. VBMWB is a day of inspiration, sisterhood, love, and laughter that features a live auction, raffle prizes, and complimentary swag bags for attendees. This yearâ€™s featured guest speaker is Felecia Hatcher â€“ founder of CODE Fever and Black Tech Week. Vagabond Kitchen and Barâ€™s Chef Table is back just in time for Valentineâ€™s Day. A group of 10 single ladies can experience a delectable prix fixe menu with bottomless bubbles at $75 per person. The adult tickets are $75 per person. For the first course, Chef Roberto Dubois has cooked up Yellowfin Tuna Tartar with fresh Ahi Tuna, avocado, sesame oil and cilantro. The second course is a delicious Truffle Gnocchi with truffle cream, porcini mushroom and mascarpone followed by Beef Tenderloin and Maine Lobster Tail. Guests can enjoy a Dark Chocolate Bar with chocolate ganache, hazelnut, caramel, and pistachio ice cream and a Rouge surprise consisting of mascarpone mousse, creamy raspberry, cherry cream and pistachio. Once again The Eric Charles Group is on the scene serving up the BEST of Urban Groove – dance R&B, Soul and other YouTunes that make you feel good and bring back memories of Motown and other hits of the past with a new hard edge that just may break all the rules. Help yourself to fine merlot and even finer cuisine you will not forget, brought to you by your hosts Antoine and Natalia. Help us bring in the new year in style, featuring Freddy Gasparini, Curmit Seibert, Serge ‘Na Pasashok’ OnBass and of course, Eric Charles. Vagabond Kitchen and Bar is celebrating Christmas Eve with a special menu created by Chef Roberto Dubois. From 5pm to 11pm, guest can enjoy a decadent four-course meal. The adult tickets are $69 per person. Children under the age of 12 will dine for $35. For the first course the chef has put together delicious lobster bisque. Guest may choose to have Foie Gras Terrine, Dive Scallop Gratin, or Endive Salad as their second course. For the third course there are three tasty options: 12 ounce New York Strip Steak, Miso Sea Bass, or Herb Roasted Duck Breast. Dessert will be quite the treat with the options being a Dark Chocolate Bar or Pumpkin Cheesecake. Prizm Art Fair is pleased to announce the programing and events for the fairâ€™s fourth edition. Spanning two weeks and coinciding with Miami Art Week, Prizm Art Fair will take place November 29 through December 11, 2016 at its new location: 7230 NW Miami CT in the Little Haiti / Little River community. The programing and highlights for Prizm connect directly to the fairâ€™s mission of presenting the work of international emerging artists African artists and artists from the Global African Diaspora, who are traditionally unrepresented by galleries in the mainstream art world. The theme for the fourth edition will explore the global impact of Africaâ€™s cultural DNA and will showcase over 40 artists from eight countries including: France, Haiti, Jamaica, Nigeria, St. Martin, and Trinidad and Tobago, split between two sections curated by fair Director and Founder Mikhaile Solomon and interdisciplinary artist William Cordova. VIP Ticket holders are invited to a special Prizm Preview with a three-course dinner by Cooper Door on Tuesday November 29th, 7- 11 pm. Jamila Ross and Akino West of Copper Door, will create a culinary pop-up experience to introduce some of the signature dishes Copper Door plans on serving at their “coming-soon” BNB project. This thirty-minute performance aims to bring together three generations of Haitians to tell a story of belonging, longing, achievement and their contributions to global culture. This story will be told through instrumentation and performative actions made by the artist and a small ensemble of Haitian residents of Miami. The ensemble will be made up of family and friends of the artist who live in Miami and are musicians in their church (Salvation Army) band. Smith dressed as a military general will lead the ensemble through a series of formations and dialog that bounces between English, French and Haitian Creole, punctuated by musical scores. As a Haitian descendant, Smith knows very little about the history, culture and legacy of the Haitian people and is using this project to learn about the aforementioned while bringing the ensemble together to share their knowledge and experience making together. Evans delivers a layered performance that is part social commentary, part autobiographical. An interactive performance piece, “Gurl, I’ll Drink Your Bathwater,” a piece originally created in 2015 for Performance Anxiety in New York, NY. Within this project the act of washing represents various ideas. There are references to the religious use of water to cleanse the soul, the need for women to be “clean” in our society, beauty ideals in the US, and even a nostalgia for the Palmolive soap used in the piece because it is the same dish washing liquid used by the artist’s mother and grandmother. The title is based on the Black American old school saying, “You’re so fine, I’d drink your bathwater.” This phrase has been used as both an extreme compliment and as an all too familiar catcall for Black women. For the the iteration performed at Prizm, has a new ending has been added. Artists Jamea Richmond-Edwards and Amber Robles-Gordon, Co-Founders of Delusions of Grandeur artist collective will speak of the relevancy, evolution and power of artist collectives and artistic movements. Richmond-Edwards and Robles-Gordon, parlayed a series of conversations about personal experiences in the art world, the cultural influence and legacy of Howard University, and the examination of artist group and movements such as Spiral, Black Artists of DC, Africobfra and the Black Arts Movement to build a contemporary art cannon. Delusions of Grandeur is a collective of emerging artists brought together by a shared interest and commitment to their art, a need to provide critique and commentary on social infrastructures within American society and to contribute to the prominence of the collective black voice and presence within contemporary art. Delusions of Grandeur is comprised of artists Shaunte Gates, Jamea Richmond-Edwards, Amber Robles-Gordon, Stan Squirewell, Wesley Clarke and Larry Cook Jr. The history of art in the Caribbean exists in its fragmented past, resulting in the rich and culturally diverse artistic practices present throughout the region. Despite the immense impact that Caribbean art forms have had on the economies and unique cultures of these islands, many of their artistic practices have been inadequately researched and documented. Furthermore, Caribbean art forms are oftentimes left out of the national discourse within education. This presentation aims to address the lacuna present within Caribbean art education through presenting an online platform that will provide information and resources to regional and global audiences. Duverney discusses her exhibition, The View From Nowhere, a showcase of social justice-driven large-scale drawings and mixed media works created to give a â€œvisual voiceâ€ for those who continue to be silenced. Her work comes from her own lived experiences and observations, with themes ranging from criminalization of black and brown, bodies, gentrification, housing scarcity, and other pressing social justice issues facing women and people of color in New York City and the United States at-large. Karen Senefuru discusses The Black Woman is God exhibition, a multi-media visual and spiritual exhibition for audiences to recognize an alternative to Western cultural narratives that challenges Eurocentric notions of God. Through an examination of cosmology, womanhood, feminism, politics and psychology, The Black Woman is God challenges gaps and fragments in art history that position Black art as only ancient or contemporary, failing to honor the space in between. The Famous Art Critics is a cohort of multi-cultural art enthusiasts who gather for dinner and dialogue annually during Miami Art Week to discuss, highlight and elevate diverse individuals, institutions, and best practice for pathways to cultural equity in art: journalism, curation, and execution praxis. Tickets: VIP Passes for purchase on eventbrite. Everyone loves receiving money on their tax returns. The Tax Team and Vagabond Kitchen & Bar are bringing money to life through live art during Art Basel on Saturday, December 3rd. Artists William Live Livesay, Dude Be Awesome, Le Creep and Atomik will each be painting a blown up $100 bill. Enjoy the best drinks, bites and beats in MIMO. Winewood Restaurant and Wine Bar welcomes back the Eric Charles Group for a post-Halloween night of fun, dancing and DA BLUES ! The Eric Charles Group is a Rhythm & Blues, Blues & Soul based band, playing a wide variety of material that will make you want to get up & dance! The group has performed in Europe and the United States and features the tried and true: Al Green, Marvin Gaye, Albert King, The Crusaders and a variety of others sure to please. Start your weekend sooner with Vagabond Kitchen and Barâ€™s â€œMiMo Thursdays.â€ Come and enjoy $50 Moet bottles while you dive into small plates of the chefâ€™s choice such as the Tuna Poke Toast, Mini Wagyu Burger or Octopus Pinxto during happy hour from 6-9pm. If you feel yourself in a cocktail mood instead, have one of their hand-crafted cocktails for $8 or a well drink for $7. Guests can also enjoy beer and wine during happy hour starting at $5. Grab your friends and head to Vagabond Kitchen and Bar for a guaranteed good time. Celebrate the season and join Savor Tonight and fellow food & wine enthusiasts on Thurs., March 31, as we Spring into Spring at The Federal: Food. Drink. Provisions. We have teamed up with the restaurant to host a 4-course dinner that will highlight some of our favorite spring ingredients — and each course will be served with a matching wine pairing. For this event, we’ll sit down to enjoy a four-course dinner and each course will be paired with a matching boutique wine, hand selected by Ani Meinhold, aka the Bar Wench, at The Federal. Cost is $65 (all-inclusive), if purchased by the end of the day on March 28, and $70, thereafter, if space is available. Your spot will not be secured until we receive your payment. Come alone or bring a friend, as all are welcome. Celebrate your true PUPPY LOVE with us this Saturday, February 13th 2-6PM! Enjoy ooey gooey grilled cheese with your pup(py love). Furry four-legged friends (welcome to attend). Welcoming the year of the Fire Monkey – CounterCulture Club Nights resumes at Miami Ironside with an evening celebrating Chinese New Year. Experience Asian contemporary art, design and music presentations from Art Lexing, Gauchet Fine Art, our newest concept retailer and design agency OKKIO, along with guest speakers from the Miami-Chinese community. In the house and one of American’s top 50 new restaurants, Blackbrick Chinese by celebrity chef Richard Haley, will also be serving up some yummy Dim Sum platters and Craft Cocktails. Come on out an experience the #cool of the Upper Eastside. IT’S DA BLUES Baby! This night is dedicated to local singles who need a pre-weekend outing to mingle and warm up for the weekend. About the time Blues is not doing it for you, we pull out Bobby Caldwell, the JBs, Bonnie Raitt, Wilson Pickett, Rolling Stones, Marvin Gaye, Al Green and Eric Charles original material that will make your bottom bump on that seat. Great food, a great selection of refreshments and great people make this a night you won’t want to miss! Join me, Maria de los Angeles (a.k.a. @vicequeenmaria) at Via Verdi in Miamiâ€™s MiMo District for the first-ever Success Social Miami — an evening of social networking and sharing of best practices. Inspired by BarCampâ€™s â€œunconferenceâ€ style and Ignite Miamiâ€™s presentation format, each speaker has 10 minutes to share a story. Yes, you can pitch your business, but make sure itâ€™s about your best practices! What did you do with the results you produced? Six speakers will share their stories between 7 and 8 PM, but I encourage YOU to talk about the same topic before and after, while we mingle, network and enjoy refreshing cocktails as well as mouth-watering bites from Via Verdi. We are all co-creators in this event. If you are interested in speaking, please sign up at Eventbrite. 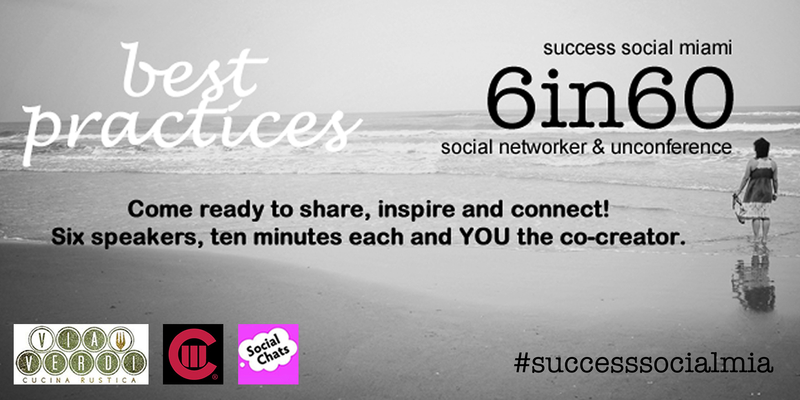 Success Social Miami isn’t just for social media and communications junkies. It’s for anyone who wants to network and share best practices in a mindful community. Everyone — from newbies just starting out their careers, to professionals and retirees — are welcome. By sharing, we can help each other succeed. Diversity of experience is appreciated. Everyone has a story to tell. Enjoy cocktails and appetizers at happy hour prices and 10% off your entire check for dinner after 8 PM. Business card drawing for Brunch for Two (up to $50 value) at Via Verdi and Instagram photo contest for a bottle of Prosecco. Please click on the Eventbrite link for more details. Success Social Miami wishes to thank location host Via Verdi and media sponsors Social Chats and Association for Women in Communications, South Florida Chapter. Sponsorship opportunities are available. For further inquiries please email vicequeenmaria@gmail.com. Celebrate the arrival of both Art Basel and Lizarran as they return to their only U.S. home city, Miami! Join Lizarran as the internationally recognized Spanish Mediterranean restaurant hosts a pop up gallery with music and artist installations by IKORMA, Alfredo Borjas and Rodrigo Gonsalves. Enjoy Lizarran’s famed pintxos and homemade recipes such as the gazpacho and pintxo de tortilla Espanola from the brands only food truck! South Florida Lindy Collective is Extremely Excited to announce our upcoming Vintage Style Session! Internationally known for her style and grace, Miss Jenna Beth is going to teach you how to look your vintage best! This class will feature a 1920s look and is open to both ladies and gentlemen. Attendance is limited to 20 students, so make sure you get your tickets! You can even shop L.A. Boudoir, open exclusively for us, for some fabulous finds! PRIZM is the producer of a cutting-edge art fair that is multidisciplinary in scope. Our goal is to expand the spectrum of international artists from the African Diaspora and emerging markets at one of the most prestigious art festivals in the world. Our mission is to promote the work of artists of color, who reflect global trends in contemporary art, through a blockbuster exhibit held during Art Basel/Miami. Workshops and special events will be organized throughout the year to advance the careers of local and regional artists. We are committed to the Miami cultural community and will work to expand its visual arts landscape, nurture and educate its constituents and provide forums for cross cultural exchange. Additionally, PRIZM will feature the work of emerging Miami-based artists of African descent, such as T. Eliot, and Asser Saint Val. These artists redefine their world and bring into focus socio-political and cultural issues pertinent to the people of African descent in Miami and beyond. The select artists are actively engaged in perpetuating Miamiâ€™s growth as a cultural hub. Join Prizm To For An Evening Of Cocktails With Our Exhibiting Artists To Mark The Beginning Miami Art Week. Prizm hosts Prizm panels; a series of conversations & film screenings presented by leading thinkers and practitioners in contemporary African and African diaspora art. Panelists will include Kebona Mercer, Professor of Art and African American Studies at Yale University, contemporary visual artist, Jefferson Pinder, Charlotte Mouquin Voznesenskaya & Oshun Layne of Rush Philanthropic Arts Foundation, and others more. Prof. Mercer will discuss his new book, Travel & See, in which he presents a diasporic model of criticism that pays close attention to the aesthetic strategies in contemporary Black diaspora art. He also traces the shifting political and cultural contexts in which black visual art circulates over the last 35 years. More than two hundred years ago, the slaves of Haiti defeated Napoleon’s armies in the historic revolutions that took place between 1791-1804. One of their weapons was the very tool they used to work the land, the machete. Papa Machete explores the esoteric martial art that evolved during the slave revolts through the practice and life of a farmer named Alfred Avril. The short film documents his proud devotion to his heritage in the face of bitter poverty, and his efforts to keep this mysterious art alive. 4:30 Pm – 5:30 Pm Rush Philanthropic Arts Foundation talks about their work in Brooklyn and how theyâ€™re using the arts to educate. With Sonic Sounds From King Britt. Prizm Will Also Host A Basel Domino Tournament. 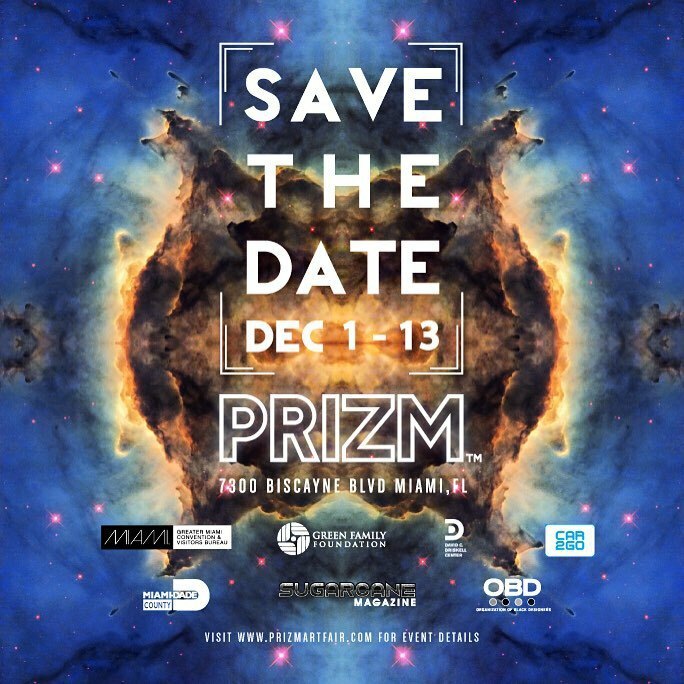 A break from Miami Art Week, Prizm hosts a mid-day social. Join us with our co-hosts rush philanthropic arts foundation for cocktails, music, light bites and networking with friends in art. King Britt will provide the righteous beats for the day. At 5:30 PM, contemporary artist, Jefferson Pinder, will present his performance piece Dark Matter(s) reaching Lionz of Zion. Jefferson Pinder has created a morality play of sorts in which there is entanglement of music, athleticism and power. Slightly didactic, partly formal and consistently explosive, these break dancers will be lying their bodies On-The-Line to produce a dynamic performance that frighteningly brings rioting and B-Boy battles to contemporary art. Lizarran is back in Miami making their U.S. debut with the brandâ€™s first ever food truck! Lizarran will be serving their signature Spanish Mediterranean fare offering a variety of their internationally recognized pintxos such as the tortilla EspaÃ±ola with jamÃ³n serrano and cones of croquettes and Nutella topped churros. Founded in 1988 in Stiges, Spain, Lizarran transports you to the Spanish Mediterranean with a modern twist. Come enjoy a night of Holiday Shopping at L.A. Boudoir Miami with a Pop-Up of Mary Kay Cosmetics. Enjoy complimentary wine, take 20% off clothing and jewelry and visit the Mary Kay area for a chance to win a beauty make-over. Attendance is limited to 25 students, so get your tickets while they last! Internationally known for her style and grace, Miss Jenna Beth is going to teach you how to look your vintage best! This class will feature a 1940s look and is open to both ladies and gentlemen. You can even shop LA Boudoir, open exclusively for us, for some fabulous finds! Attendees will receive 10% off apparel and 20% off accessories during this event only! We will also be having an after-party at Ball & Chain’s Karaoke & Ladies Night to show off our stuff, so get ready for some fun (as always)! How do two of Miamiâ€™s best restaurants celebrate their recent Miami New Times â€œBest of Miami 2015â€ awards? By teaming up and throwing their fans a celebration party! Ms. Cheezious, voted â€œReadersâ€™ Choice: Best Food Truckâ€ (5 years in a row), â€œReadersâ€™ Choice: Best Inexpensive Restaurant,â€ and â€œBest Mashup,â€ is joining forces with Taquiza, voted â€œBest Tacos,â€ to celebrate and give back to their fans. The cheese-and-taco-loving party will feature $5 bites like an ooey gooey cheesy quesadilla smothered in Victoria-onion jam with the option to add smoked chicken or BBQ pork (you know, if Ms. Cheezious and Taquiza were to have a baby); torta with lechÃ³n, avocado-guajillo spread, and citrus-pickled onion; deliciously smoked chicken nachos with mole, yolk, and bacon (also smoked in-house) for a brunchy fix; street-style esquites with shmayo (chicken-schmaltz mayo! ); and finger-lickinâ€™ BBQ pork sliders. Cool libations will include $2 Sixpoint craft beers and tasty Tequila AviÃ³n cocktails. And beyond good food and drink specials, fans will jam out to some throwback soul, funk, and hip-hop brought to you by DJ Kumi, challenge each other to games like corn hole, JENGA, Cards Against Humanity, and enjoy the cool â€œSunday Fundayâ€ vibes outside on the Ms. Cheezious patio. Your invited to celebrate our 5 year Anniversary with us and Via Verdi. Perfect way to start your Mothers Day weekend. This years theme is 1950’s Prom. We highly encourage everyone to dress in theme as we will have a photographer snapping some pictures. LA Boudoir will have 10% off all purchases made during our celebration. This event is open to all and feel free to share with friends. MiamiUnder40 is turning 1Years Old and we want you to come celebrate with us! You’ve networked with us now it’s time to party with us! Location: Private Location address will be send once tickets are purchased. Please join us this Friday, April 3rd in celebrating the opening of MADE, a creative co-working space in Little Haiti. Starting at 3pm, join us for coffee, waffles and tours. Happy hour starts at 7pm with drinks, great art, t-shirt and tote printing, live music by Ajhanou Uneek + Rara Walk and more. No RVSP necessary. Parking is available in the lot across the street on 83rd Street. Indique Hair, the leading premium hair extensions brand in the global market, invites South Florida to celebrate its Miami boutique with a grand opening event featuring complimentary hair giveaway, exclusive discounts, styling tips, and more. Indique Hair Co-Founder and Creative Director Ericka Dotson will host a ribbon cutting ceremony at 1 p.m. for its 15th global location. The entire Indique Hair line of lustrous, tangle free, unique Indian virgin and natural human hair extensions are available: BOUNCE Collectionâ„¢, SEAâ„¢ Collection, HYSTERIA Collectionâ„¢, PURE Collectionâ„¢, STUDIOâ„¢, and KERATIQUEâ„¢ Collection. Celebrity clients include Lady Gaga, Kelly Rowland, Lala Vasquez, Gabrielle Union, Rihanna, Ciara, Brandy, Zendaya and more. There is a limited number of tickets, so purchase your tickets soon! The MIMO Biscayne Association and the Miami Design Preservation League present the X2 Bus Tour. Tour and see both Miamiâ€™s Historic MIMO District and Miami Beachâ€™s North Shore Historic District on one bus tour. Live commentary on the history and architecture of both districts with your guides, Franzi Medina from MDPL and John Bachay from MIMO Biscayne Association. Includes a stop at the newly renovated historic Vagabond Hotel. Proceeds benefit the Miami Design Preservation League and the MIMO Biscayne Association. Tabasco & Chef Cesar Zapata Preview SOBEWFF Menu at The Federal on Wednesday, February 18, 2015. Ms. Cheeziousâ€™ â€œThe Big Cheese Partyâ€ on Friday, February 13, 2015. Â Â The amazingÂ fine folks at â€œMiamiâ€™s Best Food Truck,â€ Fatima and Brian Mullins and M. Christian Dickens, celebrated their grand opening of their first brick-and-mortar restaurant located atÂ 7418 Biscayne Blvd in the MiMo District. Â Know you can get the best grilled cheese and tomato soup at their restaurant. Vagabond Restaurant and Bar soft opening in the new renovatedÂ Vagabond Hotel on Monday, January 12, 2105. The VagabondÂ Hotel is located in the MiMo District at 7301Â Biscayne Blvd. We started out with the peanuts and chapulines with Szechuan peppercorn and lime and I could not stop eating them so yummy. Â Then we had the zucchini salad with pistachio, tarragon and pipian sauce. Â The heirloom tomato fattoush salad with black sesame, sheep’s milk feta and black radish. Â The crispy fingerling potatoes with smoked paprika and sherry vinegar was so good. Next we tried the roasted baby carrots with mole, hazelnut, yogurt and za’atar and the sweetbread milanesa with swiss, country ham vinaigrette and mustard dill and it was delicious. Â Next on the list was the iberico skirt steak and it was cooked and seasoned perfectly along with the Â sweet and sour sun shrimp both were amazing. Â Then we had the buttermilk fried quail. We made it to the desserts and my favorite was theÂ pistachio cake it was so amazing it is a must try. This exclusive party will make you forget about stupid cupid. Follow @PassionSpirits & @LustVodka on Instagram to earn access (the password) to this party and to be a winner of a Complimentary Bottle Service with a table for 6*. Midpoint Presents: North of Modern Â Art Basel 2014 curated by Joshua KingstonÂ on Saturday, December 6, 2014. Artist Lineup:Â Christin Paige Minnotte,Â Deborah Gray Mitchell,Â Eleazar Delgado,Â Erin Parish,Â Evo Love,Â Gianna DiBartolomeo,Â Gregorii Trombo,Â Hilma Koelman,Â Ivan Castillo,Â Jonathan DeCamps,Â ERMAN,Â Monique Lassooij,Â MANO,Â Tracy Cristal andÂ Wesley Alvarez. The offices at 8330 Biscayne has become a core of political organizing, movement convergences, direct action planning, and a host to civil rights legends and amazing activists. Join us as we transform the space! We’ll be hosting an exciting night of art, music, libations, and liberation with local artists, muralists, and live performers. Purchase a $10 ticket online and get a $20 tab good for Sushi and Cocktails during showtime! 2 for 1 goes on until 8pm! Miamiâ€™s Abstrk, Atomik, Pucho and Quake are four legendary MSG crew artists with a large following with the amazing talent and street creed to match. There will also be additional paintings and sculptures by Crome, Hoxxoh, Hest, Arive, Xeno, Five, Ox, Eson. The show will be co-curated by Jill C. Weisberg and Omar Khan. The artists have have collaborated with New Era and Cool Jâ€™s. Abstrk, Atomik, Pucho, Quake have designed their own limited edition snap back hat with New Era, the industry standard in handcrafted, embroidered caps. MSG has been creating large-scale graffiti murals in Miami, Florida for close to 20 years. Artists range from sculptors and bombers to fine artists and illustrators. The MSG crew started when a group of up and coming artists were doing a new style of graffiti that they considered Miami Style Graffiti. MSG members didnâ€™t feel that the established crews, who were still doing 80â€™s style New York graffiti at the time, represented their work so they started their own movement. Back then there wasnâ€™t the internet to lean on for inspiration; there was break dance movies, zines and the competition. The older artists kept their techniques to themselves because they were threatened by the younger artists who were getting up everywhere and backing that up with first-rate productions. Now MSG is the established crew, but times have changed and now they feel part of the same community that once persecuted them. Serving as a focal point of SCOPE Art Show, the HeinekenÂ® House is the evolution of the HeinekenÂ® Mural Project. It is a multi-sensory experience, featuring a live art pyramid as its core. The massive structure stands at over 35-feet tall, the pyramid encompasses 12 massive live art walls to be painted over the course of six days at SCOPE Art Show. The artists include: Christina Angelina (Los Angeles), Dulk (Spain), Greg Gossel (Minneapolis), Greg Mike (Atlanta), Hueman (Los Angeles), Look The Weird (Austria), Woes (Hawaii), Tati Suarez (Miami), Taylor White (Raleigh), Derek Gores (NYC), Lauren Ys (Denver) and Sharktoof (LA). Guests will enjoy the live interactive painting in a larger-than-life functional installation designed by ABV (Atlanta), complete with a HeinekenÂ® bar and four open facades for an open-air experience. $10 for $20 off sushi and cocktails. Online Only!